News: RF Generation: We really love that Sega Dreamcast fishing controller and Sega Bass Fishing. I started this game on a whim since I was getting frustrated with Tecmo World Wrestling and wanted to try a different sports game. It's alright for a bowling game on the NES, although it really needs some more game modes. I didn't realize that the win condition was just to complete one game, but I guess I'm entitled to some low-hanging fruit as well. 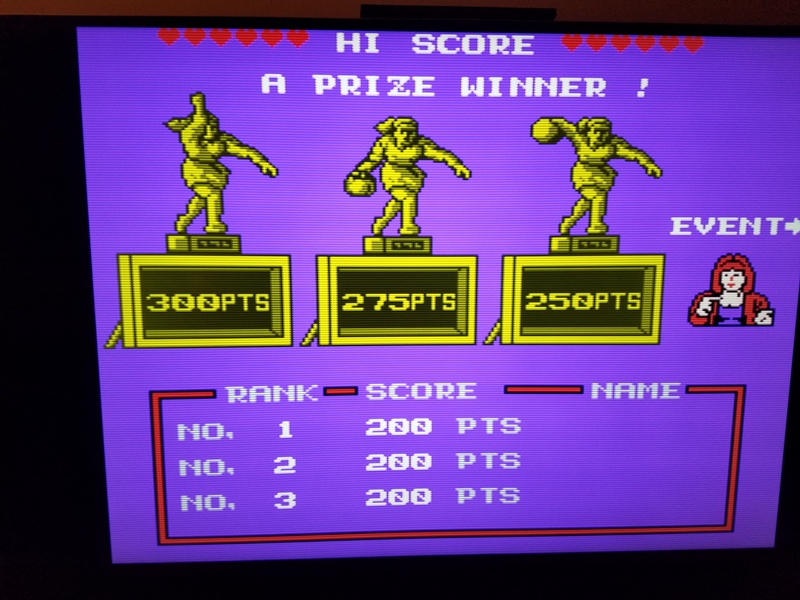 Since this fulfills my goal of one sports title this month, I'm going to relinquish my claim on Tecmo World Wrestling. I may come back to it later, but somebody else can take a crack at it if they want. Dead or Alive your coming with me. Robocop is done! Actually pretty well done adaptation of the movie for an NES game. Fun cutscenes and pretty good music that is slightly repetitive but does have the Robocop theme in there. R.C. Pro-Am completed. The game loops after 24 stages, so here is a picture of the beginning of level 25. Hadn't played it in a while, but it holds a special place of nostalgia as it was the first racing game I owned, getting it for Christmas when I was 8. As a racing game it holds up well, and feels fairly fast, but the controls feel a litttle off, sometimes feeling loose and other times feeling overly responsive. All in all still a worthwhile playthrough. Games beaten and claims updated to here. Congratulations all! We are over the 200 games beaten hump and now sit at 205! Can we knock out 45 more games in February to hit our goal? Kid Niki is finished. Always one of my faves when I was kid. Really interesting bosses, especially the Mad Monk. 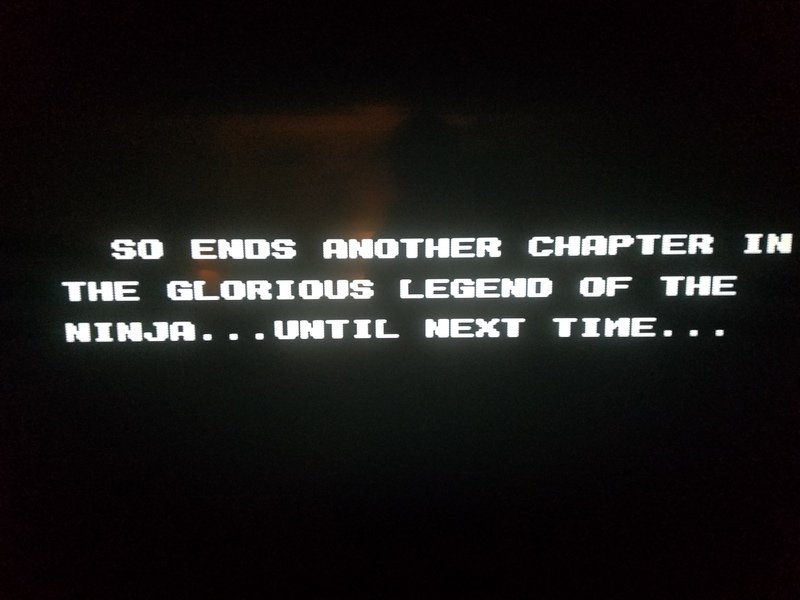 First time beating it, though. Feel the need for more dungeon crawling. Next claim is Swords and Serpents. Fairly new one to me, although I think I may have dabbled with it in the past. Despite being kind of rigid and simplistic, I still liked it. Honestly, it's kind of a poor man's Double Dragon, but it's not bad. Worth a playthrough. That final boss is pretty cheap though with his 1-hit kills. I'm back home and back to slaving away at Bases Loaded 4...... Got to 64 games out of my 74 tonight. Although I've yet to win 10 games in a single session, I'm hopefully I can do all 10 remaining games tomorrow and finally be done with the Bases Loaded series. I have the most trouble against New York and I just beat them tonight so unless they end up being the team I face in the world series it should be smooth sailing. If they are the world series match up, it's not gonna be pretty though. Great job while I was away though and another huge thanks to singlebanana for keeping the lists up to date on here for me. Looks like we have 8 days left for February and we still need to beat 43 games. That's a little over 5 a day which is a fairly tall order at our current pace, but there are still a ton of easy completions left if anyone is feeling up to knocking out some quick wins for us. Once I'm done with Bases Loaded 4 I'll go see what I can do for shorter games to help us get to 250 for the month. I stayed up way too late last night making this happen, but I didn't want to stop after I got over halfway through it. This game starts out good enough through the first half, but it gets really hard in the second half. Imagine if Ninja Gaiden had 1-hit deaths and you have a pretty good idea of what this game is like. Most longplays of this game on Youtube are in the 10-15 minute range, but it took me nearly 2 hours to finish. Mechanics are really good, but it becomes kind of a slog during the second half if you're unfamiliar with the levels and enemy placement. Enemies and projectiles come at you so fast from off screen that you have to start inching forward at a snail's pace in order to avoid them. Overall, it's fun to play for a couple of levels, but you really have to know what you're doing during the later levels. I've been kind of agonizing over this, but I need to bow out of Dragon Power. I've spent over six hours playing it and I cannot beat it without cheating. It is fairly easy to get to the seventh level (the game has unlimited continues), but dying after that puts you back at the seventh stage (there are ten in total). The only way I can see to finish the game is to play it near perfectly from the beginning (without losing all your lives) while also picking the correct wish at the Shen Long, or get amazing RNG and somehow manage to get cakes (near full health regeneration) a lot. I think I need something that requires less reflexes, and since it is open I would like to claim Final Fantasy. I think I might go for a two or three Black Belt party though (with either a white or red mage), just to make it interesting. “To Alderaan we fly on course direct, And to this feast of death I’ll not object." 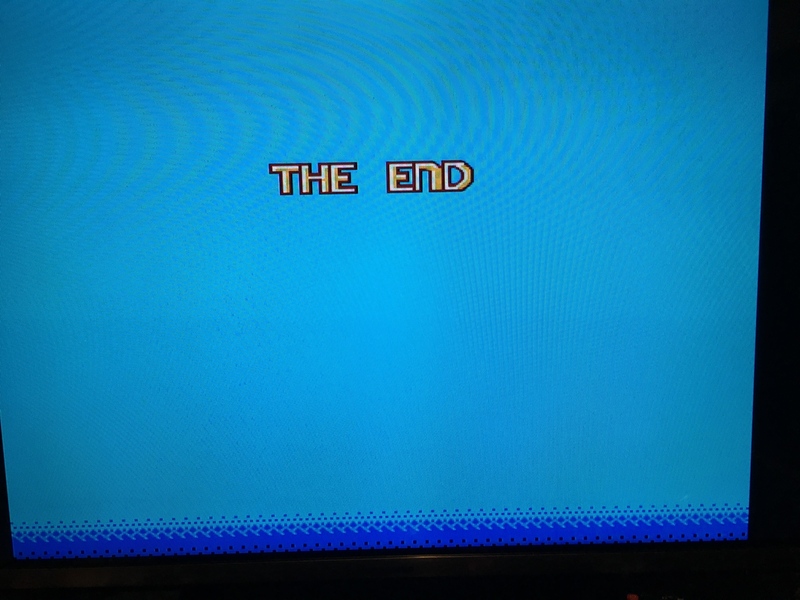 Bubble bobble part 2 done... 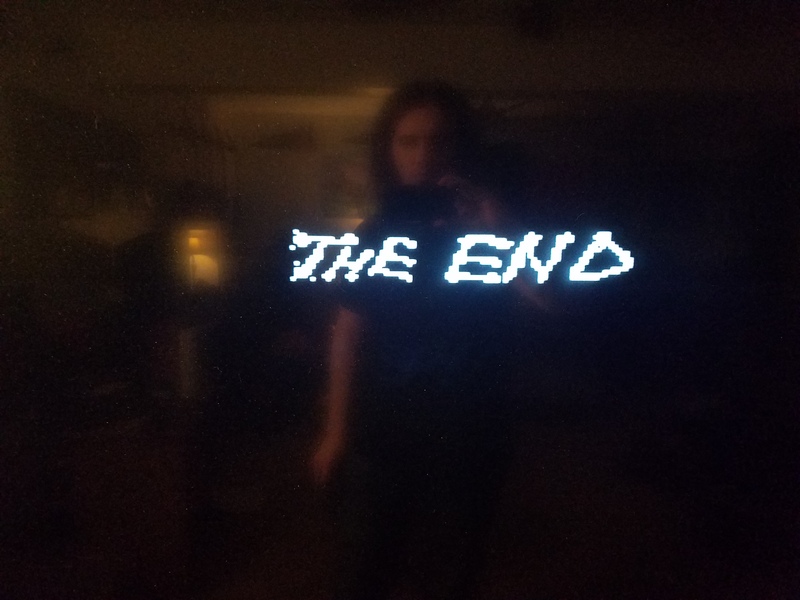 I missed the The End screen after this, it was credits and quickly back to the start screen. For the most part I like this game the biggest drawback as if you wanna play 2 players you have to take turns. I don't feel the different monsters they added to this one added anything to the game. The stupid tree that shut out bees killed me so many times. All in all decent game I don't think it's worth more than 50 bucks though. Save your money played on the ever drive lol. Feast upon these atrocious scores for Skate or Die but all events have been recorded. The controls are very strange feeling in this game, and that is pretty much what I remember when I rented it from the video store. Does this count as complete or should I try for better scores. Also not sure why it recorded my last jump which was 3'2" when my highest was 4'6". My next sports claim will be Super Spike V'Ball Also my claim of Swords and Serpents hasn't been tagged. Thanks! Wasn't quite able to finish off Bases Loaded 4 Got to my 71st game though and was fortune enough to draw Hawaii as my rivals for the Super Series so tomorrow is a sure thing! @Disposed Hero - Ninja Crusaders sounds like it might be up my alley. Havn't played it before, but I'll have to check it out some time. @bombatomba - I havn't put in a good effort on Dragon Power before, but the little bit I played it seemed pretty brutal. Good effort regardless and I'm sure someone will pick up the mantle later in the year. 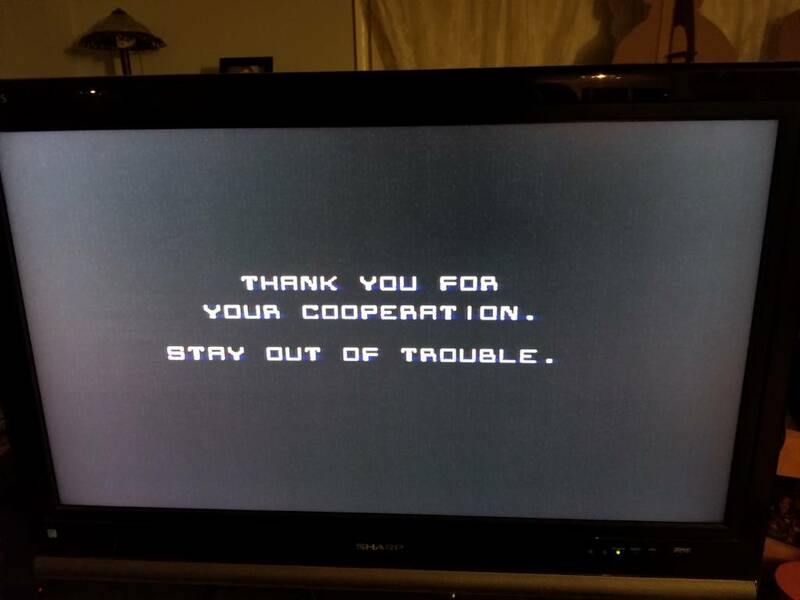 @douglie007 - totally agree regarding Bubble Bobble Part 2. Going from simultaneous co-op play in the first game to swapping turns in the second one seems like a big step backwards. 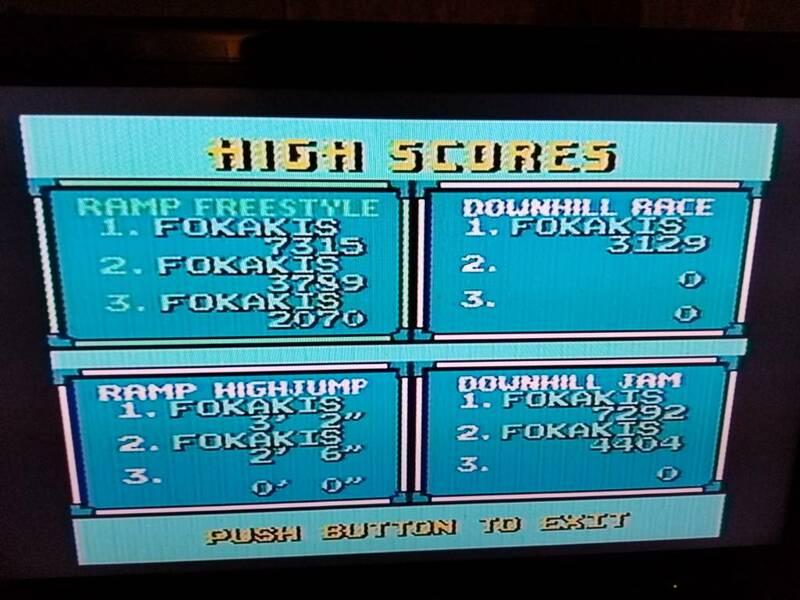 @Fokakis79 - Your Skate or Die score is totally fine, no need to upgrade those scores unless you just want to strive for a personal best. Made sure your claims were updated properly this time, sorry about that. With our sports month winding down I wanted to encourage any of you who haven't beaten a sports title yet to use this final week to take one down. I realize some of them have ridiculously long seasons that not everyone has the time or stomach for so I thought I'd help you all out by shining a spotlight on several of the more obtainable sports titles that we need someone to tackle. If you've got a power pad the games on it are all incredibly short completions. Athletic World, Dance Aerobics, and World Class Track Meet/Stadium Events are all sports titles for that accessory that can be beaten quite easily in under 2 hours for Dance Aerobics and under 1 hour for the others. Caveman Games, Crash n the Boys, Gold Medal Challenge, Ski or Die,Snoopy's Silly Sports Spectacular and World Games are all incredibly short games that shouldn't take most players more than 1 hour to beat. 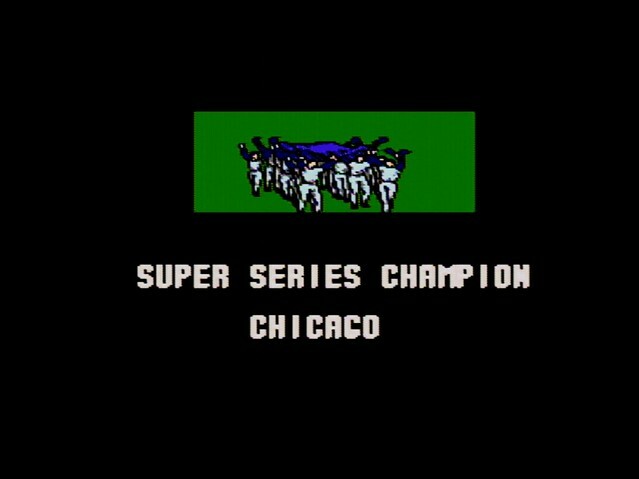 Bad News Baseball, Baseball Stars II, Bo Jackson Baseball, Dusty Diamond's All Star Softball, Legends of the Diamond, RBI Baseball and Tecmo Baseball are all baseball titles which DO NOT require you to play insanely long seasons and can be completed withing 1-4 hours of play. Bandai Golf, Golf Grand Slam, Jack Nicklaus 18 Holes, Lee Trevion's Fighting Golf are all 1-2 hours worth of golfing madness a piece!! Hopefully these give you guys some ideas and incentive to knock out a few more sports titles with me this month. You may even find you enjoy some of them like I have in the past. Let me know if you want recommendations beyond these or more insight into any of these titles before you spend some time with them and I'd be happy to elaborate as I've beaten many of these in the past. It is done!! 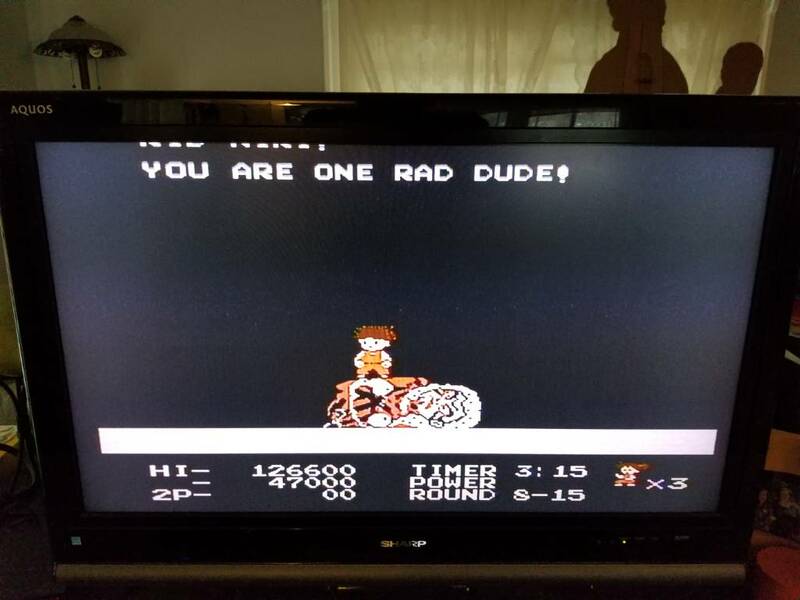 I'm really curious when I edit the video together how long my actual game play time is going to be (and then I'll have to double it for all the failed attempts that didn't get recorded), because I feel like I may have spent more time on this game than any other NES game I've beaten. And none of it was particularly enjoyable. Never really figured out how to bat consistently, the fielding was garbage and it was easier to send my pitcher running all the way to center field to catch a fly ball than to use my center fielder, throwing was very inconsistent speeds, player stats seemed meaningless, the star system was so hard to use that there was only one game out of the well over 100 that I played in which I even got 6 out of 8 possible stars, once you through a ball you couldn't control your fielders so my short stop would often unintentionally run into a ball meant for second base which always slowed me down enough that the runner I was trying to throw out would be safe. Bases Loaded 3 had an interesting single player game to it. 1,2 and 4 just have super long boring joyless seasons to play. To give you guys a reference for the amount of time I put into this game, while playing I also watched: 3 seasons of The Wire, 2 seasons of True Detective, Three Billboards, Annihilation, and about 10 1-2 hours podcasts. Super relived to be out of this game and able to move onto more interesting titles.